Congratulations to Jeff Holmes, an undergraduate student in the Food, Nutrition and Health program, on receiving the Applied Physiology, Nutrition and Metabolism Undergraduate Research Excellence Award. Jeff’s research project is titled ‘Serum zinc, copper, and selenium concentrations after 12 weeks of multiple micronutrient supplementation with or without iron,’ and was part of his directed studies with assistant professor Dr. Crystal Karakochuk. 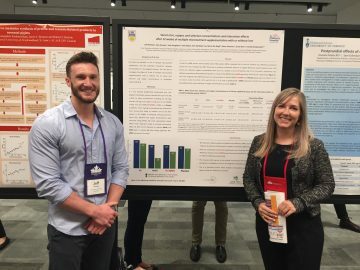 Jeff presented his research at the Canadian Nutrition Society Conference in Halifax, from May 3-6, 2018. Along with a certificate and monetary award, Jeff’s research will be profiled on the Canadian Science Publishing blog.